Last week was Sabbatical Week, although you wouldn’t think so with all that was happening at St Bede’s! I hope families enjoyed some downtime and spending time doing things together. We are beginning to prepare our students in Years 3 and 5 for the annual NAPLAN testing. 2018 was the first year for the national testing tool to be online and, apart from the Year 3 writing test, a similar regime is set for this year. I would just like to reassure families that, although we take these tests seriously, we attempt to downplay any anxiety there may be with students participating, especially the younger students who haven’t sat formal tests before. It is a one off test on one day and therefore is just a snapshot of your child’s overall ability. Next week is iPad boot camps for Year 3 parents and students. This is an ideal opportunity to understand the use of iPads in classrooms and ask questions you may have about apps and security. If you haven’t done so yet, please book one of the two sessions available. Last week we had our much anticipated Walkathon launch. The theme this year is ‘Superheroes’ and the children are very excited to be involved especially after seeing the video of the St Bede’s staff dressed up. Each Friday the students need to bring in their sponsorship card so that teachers can tally how much money has been promised. For every $10 pledged, the children receive a ticket in the raffle for the weekly prize draw. Tomorrow is the first of these draws. A huge thank you to Mrs Fox for organising the launch and sourcing the prizes as incentives. This is a bi-annual activity at St Bede’s and hopefully will provide a massive boost to our fundraising for technology equipment. We would also love to see as many family members as possible walk with the students on Friday, 10 May. Thank you to all those who have already subscribed to the new newsletter. We currently have 115 subscribers which is fabulous. We are thrilled with the contemporary design and its link to our website. Please also don’t forget to subscribe to SZapp, our alert app which has replaced Skoolbag. Easter falls in the school holidays this year and we will have all our celebrations before the break begins. ‘Stations of the Cross’, Purple Pancake day and the Easter egg raffle draw will all happen in Week 10. 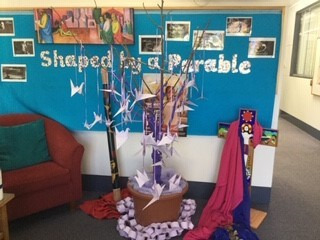 Thank you to all the families who have donated to our purple Lenten giving tree. As you can see from the photo below, it is quite a picture in our front foyer! Last week was our first tuckshop treat day for 2019 and it was very successful. Thank you to the Year 4 parents who organised this and the Year 6 student helpers who assisted with lunch distribution. It was the first chance to use our newly purchased BBQ funded by the P&F. I am away with our 5/6 campers for the next couple of days at the Sport and Recreation Centre in Berry. They were very excited as they left on Wednesday morning. For some this is the first experience of camp or even being away from home and there was a mixture of excitement and nerves as they headed off. I would like to especially thank Katie Horsburgh and Levi Heffernan for taking time away from their families to allow this wonderful activity happen. I am sure there will be some very tired bodies on Friday afternoon when they arrive back. You created all people in your image. We thank you for the astonishing variety of races and cultures in Australia and in our community. Enrich our lives by ever-widening circles of friendship, and show us your presence in those who differ most from us. Grant that we may always promote the justice and acceptance that ensures lasting peace and racial harmony. Grant that we may show equal respect to all persons of different cultures that we may come across. And help us to remember and appreciate that we are one country, with many stories. We have recently confirmed a contractor, Dan & Dan Landscaping, for our new garden areas for the beginning of June. This includes a yarning circle, sensory garden and story totem poles. In other building work, the new bus bay has been delayed due to late approvals by the government department. I also enquired about why the hessian is not fixed to the fencing. Apparently, due to the many storms we have had recently, the material was untied for safety reasons as the fencing may have blown over and collapsed. My latest understanding is that work will begin on the site next door in September. I will keep you informed as I hear more. To conclude, I would like to share with you an issue that has been worrying me for some time. Teachers or should I say all staff, hold the students safety and welfare as paramount at all times. We are here to teach, let children learn and support them wherever necessary, whether that is socially, emotionally or academically. Current research promoted by child psychologists Michael Carr-Gregg, Andrew Fuller and author, Judith Locke, suggest children need to experience natural consequences and often figure things out for themselves. In our over anxiety, we are not building resilience in them. You, as parents, can say ‘no’ and don’t always need to fix things. Children mature and grow when they take initiatives. In the words of a Deputy Principal in Sydney 'when you were teaching them to ride a bike, they wobbled. Let them wobble'. We need to be conscious of passing on our own anxieties to our children. Please don’t hesitate to contact me if you would like to discuss further.